How do you know when spring is about to arrive? Here in the Midwest, it’s been a long, cold winter and I’ve been searching for signs of life under all this white stuff covering the ground, but I haven’t seen a Grape Hyacinth or Daffodil bulb spouting through the soil yet. Then it happened! I got the official word yesterday from my dog Haley, that spring has finally arrived, and it came in with a bang this year. Dogs love their routines and one of Haley’s daily rituals is to ask to sit in my lap in the late afternoon for a belly rub (aka the afternoon lovefest). She usually rests her chin on my leg as a reminder that “it’s time”, but yesterday, she sprang onto the couch where I was sitting, got in my face and reminded me with an intense stare and a demanding groan. I was both shocked and amused because Haley’s normally a very mannerly girl, and then it hit me. Here I had been looking outside for signs of spring, forgetting that each year my dog is happy to inform me when it arrives by ushering in the season with an attitude. It’s a two week celebration of her being a bit pushy or cocky. When she was young and displayed this attitude in the spring, I laughed it off and joked about her having spring fever, I figured the timing was just coincidental. Now, after witnessing this phenomenon for eight years, I’m convinced that dogs get spring fever. I’ve never heard any other dog owners talk about this before, but Haley definitely gets a bit of an attitude. The change in season stirs something inside of her (just like us humans) and she becomes full of life, full of energy and full of herself. I love observing this reawakening each year, that extra sparkle in her eyes, the spring in her step and even the feistiness that comes along with it. It’s a time to reinforce training and to remind her of the rules, even though I’m secretly laughing on the inside because it’s so unusual for her to act this way. I wonder what triggers spring fever in dogs. It makes sense that intact male and unspayed female dogs would behave differently in the spring since it’s a common heat and breeding season, but what about spayed dogs like Haley? Is she still influenced by the biological, breeding cycle clock? Is it triggered by a reduction in her melatonin level (the sleep-inducing hormone) that happens when the days start to become longer? Whatever the cause, it’s always funny each year when canine spring fever hits. Haley’s antics make me smile while I’m waiting for the last snow to melt and the tulips to greet the sun once again. 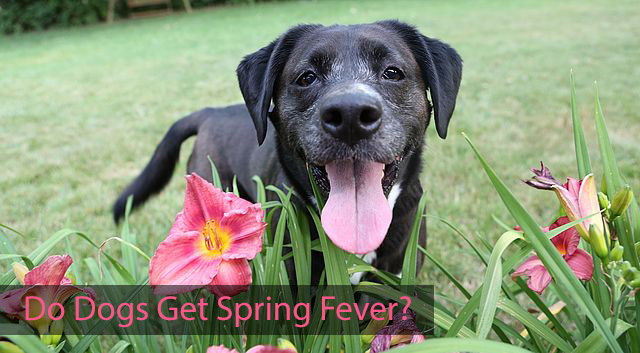 Do dogs get spring fever? I say, yes! What have you observed about your dog’s behavior in the spring? I’d love to hear your thoughts! Spring fever….hmmmmmm with my 3 huskies, I think they would prefer if we moved somewhere where it was always winter!!! hahah! Hmmm, interesting idea – I don’t know if they do…but we live in SoCal and we don’t have much of a change of season, so I’m not sure I would notice. I’ll pay more attention. I’ve wondered about that too. You’ll have to let me know if you notice any behavior changes. I’m guessing it’s more pronounced in dogs that live in areas that have more seasonal changes. I think they sense the days are longer and brighter. Torrey knows that mean more outside play time in the evening. I agree, I think it has more to do with the longer days and more sunlight, which makes me wonder if the melatonin theory isn’t true. I think that’s what happens with people too when they live in areas which distinct seasons. I bet Torrey is looking forward to the longer days. I think I’m almost ready to leave the Midwest for a place like San Diego. Of course, I say that every year around this time, haha! It’s nice having the change of seasons, but it would be fantastic having a dog beach nearby that you can visit all year long. I sure hope it’s that her knee is better and not spring fever. Haley’s getting over a sore knee right now too and it’s so hard to keep her from playing hard. Hopefully, they’ll both be back to normal soon. I’ve never really noticed this with my dogs. I’ve noticed “cabin fever” when we’re in the throes of winter and they start to get bratty and snarly with each other! I’m going to watch for this now…it sounds more fun than cabin fever…especially after the time change this coming weekend! We’ve had our first above freezing day in weeks today, so that may kick something off too! Yes, spring fever is definitely better than cabin fever, right? I can’t wait for the time change this weekend, it means spring is that much closer! My gang definitely has spring fever, Glory is blowing coat like no tomorrow and she is a wild manic in the house. They want to get out and run run run. I’m glad Haley’s not the only one acting up right now, lol! Funny about the “afternoon lovefest”. We have the “morning lovefest” here! Ah, I’m so jealous of all of you living out there in sunny Southern California. We have a morning lovefest here too, but nothing compares to the “coming home” lovefest. Thanks for stopping by today, Jackie! I’ve never noticed it in Choppy – but I am definitely going to be on the lookout for it now! (Then again, it may never be spring or summer again in Milwaukee). I call it cabin fever at my house, but I definitely see it in Delilah…hence the pooping of the pencils. I don’t know what it is, all I know is it does happen yearly!! What a very interesting topic indeed! I haven’t noticed any spring fever in our pups yet, but I sure will start looking for subtle cues!! It’s kind of funny when it happens, but I’m glad it doesn’t last very long. 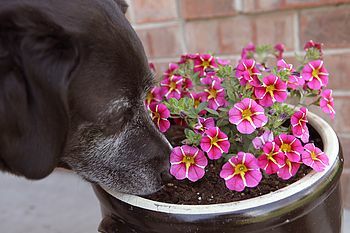 Let me know if you notice anything different with your pups this spring, Barbara. One my dogs has been extra aggressive the past 2 weeks. He stares down our other dog and then lunges at him and they fight. When they play they definitely play for dominance, and sometimes it can escalate into a fight. But this is different. This is explosive fight resulting from a stare down. Now that I think about it, I think it was last spring when this dog decided he no longer liked our neighbors dog and started “fence fighting” with him. So I’m wondering if this could be a spring fever reaction. Another weird behavior is when he was he was a puppy he would chew up my husband’s leather shoes. We trained him to not do that. But now he’s 3 years old now and has started chewing up his shoes again. Maybe there is a correlation since you remember the same type of behavior last spring. I’ve heard of a similar rise in aggression in some male dogs during the spring (especially intact males), since it’s breeding season for most animals. Hopefully this will pass soon, but in the meantime, make sure both dogs are getting plenty of exercise. Maybe add an extra daily walk to take the energy edge off to see if that helps. Definitely contact a good trainer if you’re concerned this might be something more than a short-term springtime issue. My male dog becomes more territorial and challenges me every time the spring starts. I am convinced it has something to do with the start of the season. He even growls at people when approached which he never does otherwise. He is a cute shitzu but his behaviour changes for about 6 weeks when we shift from winter into spring. My intact male has been acting out of character ever since spring started. He’s too excited to eat all his food in one sitting, he barks at things he normally doesn’t, and has become pushy/bolder. Not any serious problems, just odd and slightly annoying.